Find hotel near Egan Chutes Provincial Pa ..
Egan Chutes Provincial Park is set on the banks of the York River. Known for its rich water composition, the river has led to the surrounding soil to be abundant with fruits, flowers and minerals. Birch, buffalo berry, ash and purple flowering raspberries crowd the park. Established in 1989, it has been a natural reserve, and so, camping and other activities like mineral collection, are prohibited here. In spite of this, an easy hiking trail leads you to three fabulous sites within the park. These three waterfalls are calming, with the fresh water flowing excitedly. If you have some free time while you’re in Bancroft, do keep a couple of hours for this. Find the joy in planning a D.I.Y. trip by using this awesome Bancroft trip planner. Add accommodation and hotels in Bancroft that suit your budget including the most recommended ones like Shamrock Hill B&b, Bancroft Bed & Breakfast, Somerset Inn and House On The Hill. Find out how to reach Bancroft to begin with. Plenty of wholesome Bancroft vacation packages are available to choose from, pick your today! Love this? 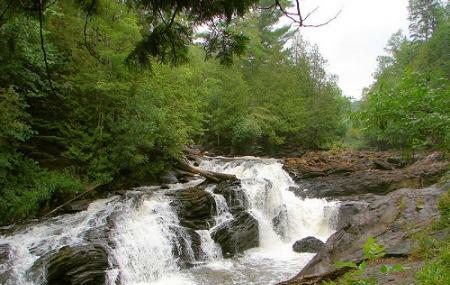 Explore the entire list of places to visit in Bancroft before you plan your trip. Fancy a good night's sleep after a tiring day? Check out where to stay in Bancroft and book an accommodation of your choice. How popular is Egan Chutes Provincial Park? People normally club together Art Gallery Of Bancroft and Madawaska Art Shop while planning their visit to Egan Chutes Provincial Park. Great short hike was easy and great for people of all ages. We brought my grandparents 75 and 78 but they are both in great shape. Gets a little tough near the end of the falls. Not much parking and is only wide enough for one car to get by. Ok i see most ppl are only aware of the short trail on left side of river which only leads to first set of rapids and has a long rough road leading in to park. THIS IS NOT THE MAIN PARK. Enter on the RIGHT hand side of river and bridge. This entrance is not marked its just a short driveway beside a rockcut. It has the information signs describing the park at this parking area. This side of river also has a MUCH longer trail which will take u to all 3 sets of chutes (rapids) . its a great place for walking the dog . there are lots of minerals to find also although the sign does say ur not allowed to take minerals from the park. Nice walk thru the forest alongside the york river ( a branch of the madawaska river).scenic rapids , and the trail is fairly flat. The main trail is lacking but there are several side trails you can follow down to the chutes. I learned the hard way that bark and leaves are just a horrible and unpleasant thing to endure. That's right there are no restroom/our outhouses thankfully there are several downed trees. The trail was clean and well shaded. The waterfall was gorgeous and the perfect place to stop for a snack. Overall a very quiet and peaceful hike.